14MGT-1190-37 GATES Poly Chain GT Carbon Belt. 1190mm Length, 85 Teeth, 14mm Pitch, 37mm Wide. 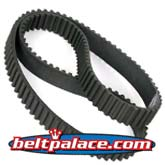 Home > Synchronous Belts > One Sided Timing Belts (Single Side Synchronous Belts) > HTD Timing Belts. Round (Curvilinear) Tooth Profile > 14MGT-1190-37 GATES Poly Chain GT Carbon Belt. 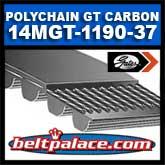 14MGT-1190-37 GATES Poly Chain GT Carbon Belt. 1190mm Length, 85 Teeth, 14mm Pitch, 37mm Wide. GATES Part Number/Series 9274. (FROM GATES:) Patented use of Carbon Fiber as the tensile cord in this belt provides increased horsepower rating for greater power density and compactness and increased flexibility, allowing use of backside idlers. Combined with Gates Poly Chain GT2 sprockets, you have a lightweight, long-lasting, maintenance-free system that's more than a match for roller chain. Poly Chain® GT® Carbon™ Belts - Nothing Tougher. Product ID: 92755085, Product Name: 14MGT-1190-37. Product ID: 92730174, Product Name: 14M-1190-37.